I’ve just reached 200 subscribers which was one of my goals when I set out, and to be honest, I wasn’t even sure how doable it was or whether there was enough of an appetite for something like Fair Warning. So in light of these milestones, here are some of the things I’ve learned so far, some things I might change, and some fun data about the project itself. Creating Fair Warning can take no time at all, or a whole lot of time. I started out doing it on a Saturday and then I realised that I actually have plans some weekends(!) so I collect all the links during the week and try to put together a draft by Friday. Some weeks the links are right in front of me, some weeks I have to specifically search them out, but one of the reasons I wanted to start this newsletter was to discover more of what other people are doing anyway, so that’s no bad thing. There have been a few weeks when I’ve been late because I’ve forgotten, or I’ve been busy or ill. I feel really, really guilty, because I’ve tried to set it up as a regular Sunday morning thing and I just haven’t been able to meet my own standards consistently, partly because I can’t schedule on TinyLetter. It’s been weird not operating in a feedback loop where an editor/the audience feeds back. I always advertise the ko-fi link and ask for feedback on Twitter and in the letter itself (on Medium and TL). I’ve been ‘given’ a few coffees over the weeks with a couple of comments, a couple of replies to the email itself, and people (mostly friends, to be fair) on Twitter. But no one has explicitly said what they like or don’t like about it, so I feel like I’m just guessing and I don’t know which pieces/sections land or miss. In one way, that’s nice, because it’s about my personal perspective, but as a “service” it’s hard to gauge how I can improve. I get notifications every time someone subscribes, and I was surprised when it started getting traction outside my immediate circle of friends and peers on Twitter. It ranges from journalists from all news organisations, to people who work in government departments, to designers, to charity people… And it seems to cut across geographical divides which was something I was concerned about. I wish I could figure out a decent way of sorting this out, because every week without fail there’s something wrong with how it formats. This is annoying but not insurmountable. Maybe I’m just being too picky. When I initially asked about creating a newsletter some people said they would much rather just read it in a blog format, so I decided to do both at the same time. A few weeks ago I decided to incentivise the newsletter to an extent by sending that out on Sundays and scheduling the Medium posts (which are mostly identical) for Monday. I don’t know whether that pushed people to subscribe or not but it felt like a better way of doing it. I am contemplating stripping the Medium post to bare-bones as a kind of teaser, and pushing people towards subscribing, but I don’t know how people feel about that. This growth is encouraging and like I said at the beginning, I wasn’t really expecting many people outside of kind-hearted friends, colleagues and other associates to really care, so I’m honestly really happy with this. I did a bit of research on open rates, and it looks like most general marketing emails get 15–28% open rate. 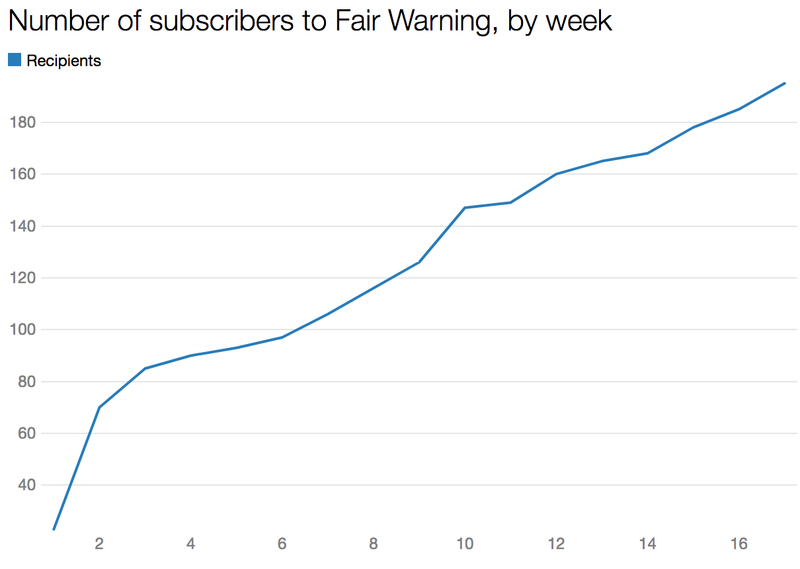 Clearly Fair Warning does a lot better than that, but I would expect (as has happened) that open rate would get lower the more people who subscribe. But, to be honest, I would rather that the people who receive the email are interested and engaged in it. I am a little concerned with clickthrough rate, because that says to me that people are either: a) not interested; b) getting enough information from the newsletter that they don’t need to click. If it’s the former, that’s concerning, but if it’s the latter then that shows I’m doing what I set out to. 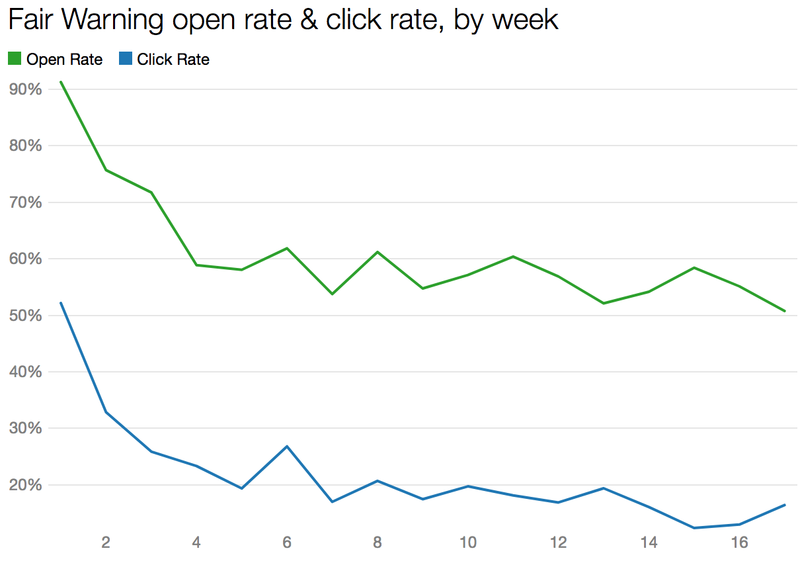 Benchmarks for clickthrough rates range from 1–5%, by the way, and I’m looking at a low of 12%. So I don’t think it’s bad in terms of the overall picture, but I just don’t know why it’s decreased recently — is it because people aren’t interested, or because I’m already telling them what they need to know? That’s much harder to gauge. What about the Medium posts? 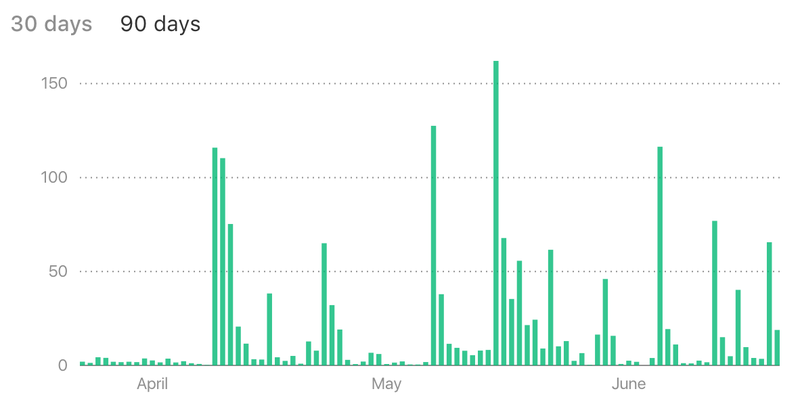 Over the last 90 days, people have read Fair Warning for 1,754 minutes (that’s just over 29 hours!) How crazy is that! Over the same time period, Fair Warning articles have been viewed 1,711 times. Lastly, on its best day (April 9th), Fair Warning saw 167 unique visitors. That was (I think) due to Brexit, Beer, and Brands. Which, weirdly, was the third worst performing newsletter in terms of open rate. I honestly hadn’t looked at all of this data before, so I’m going to keep collecting it and analysing it, and I might change the newsletter accordingly… So watch this space!